Oh no. FOMO stole my mojo! 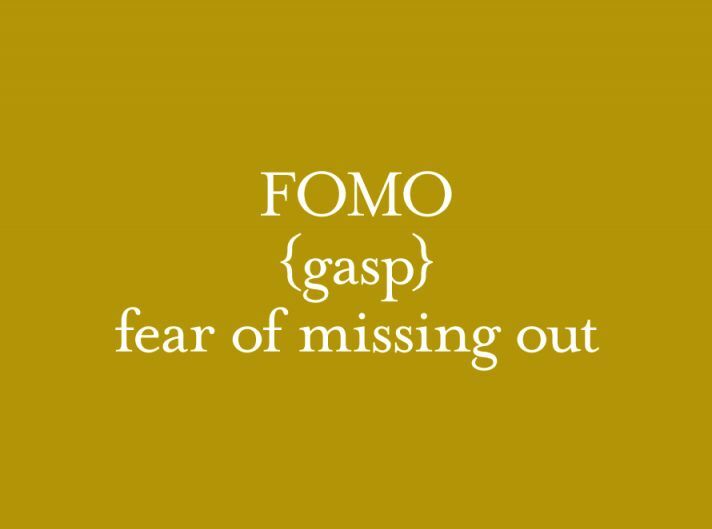 F.O.M.O – the Fear Of Missing Out. It’s a real thing apparently. The term started taking off on-line a few years ago, was popping up in urban dictionaries in 2011, and made the Oxford English Dictionary in August 2013. FOMO is a motivating force. I’m tired but I’m determined to go to this party because I have FOMO. All my friends are going to the beach. I’ve got FOMO. Maybe I’ll ditch work and join them. But it’s not just a social thing. You see it around life stage events. My friends are having kids, got promotions, bought a new car. FOMO. You even see it with investment properties. Your friends are climbing up the property ladder. You want to go with them. But FOMO is never a good motivation for such an important decision like this. We want to take a calculated, clear-headed approach to our investment decisions. We certainly don’t want to be jumping at any property that comes along because we feel a need to be keeping up with the Joneses. I think it’s interesting that FOMO has only emerged in the past few years. I wonder if my grandmother could have related to the term. We live in a world of possibilities. Where anything feels possible. And our new hyper-connected lives (connected to devices, more so than each other), throw us into a constant stream of amazing opportunities and experiences the world has to offer. But there’s still just the one of us. We only have one life, limited by space and time. We just can’t do it all. So we have to choose. But did we choose right? Maybe there was a better option. Maybe I’ve missed out on the most amazing experience this life had to offer. And FOMO bites the young extra hard – that generation that can’t really remember life before the internet. Because they can’t remember what life was like when you were contented in your choices – where you never second guessed yourself. Older people are better, it seems, at being content. I think it also helps that we developed a sense of identity that’s independent of our manufactured Facebook profiles. But we all have to manage FOMO to one degree or another. It’s one of the consequences of freedom. When you have a choice, then there will be roads that you choose not to take. But then there’s always a danger that these unexplored roads – those ‘what-coulda-beens’ – might start haunting us in the middle of the night. Or worse still hold us back from making any decision at all. So how do we deal with FOMO? Well, I think the first thing is to see it for what it is. It’s not really the fear of missing out. There’ll be a 1000 parties in America this Saturday night that I won’t go to. I’m not going to lose any sleep over it. No, it’s not ‘missing out’ per se. It’s the fear of regret. It’s the fear that you’re going to wake up the next morning, and regret the choice you made. And why do we fear regret? Because it’s painful. It sits awkwardly and uncomfortably in the body. Its voice is an unwelcome nagging in our ear. And so I think FOMO is really the fear of the pain of regret. So one strategy is to learn to be ok with the pain of regret. If you sit with it, it’s not so bad. It’s not like you’re physically being hurt. That’s not to say supress it or mute it in anyway, but just learn to be ok with it. Be grateful even, because regret is one of the ways we learn. And when we learn, we grow. At a day-to-day level, I think it’s also useful reaffirming your agency in the situation. If you have chosen one journey and not another, reframe it so your choice is central. For example, when I had kids, I suddenly found there were a lot of things I couldn’t do anymore (going out drinking with the girls for example.) Sometimes I felt FOMO. But I didn’t let myself see myself as a victim. I didn’t say, oh life and the world have taken this from me. I have lost. How unfair. Reaffirming my freedom and choice made me feel better. Another useful tip I think is to recognise the lessons in FOMO. Like jealousy, FOMO is an excellent signpost to the things we want in life. If holiday snaps from your friend’s trip to Bali makes you feel FOMO, then take it as a sign that maybe you’re due for a holiday. But I also think it’s useful to distill FOMO down to it’s essence. For example, what is it about those holiday snaps that stirs you? Is it the relaxation, is it the adventure, is it the massages and fancy food? Is it spending quality time with loved-ones? If we focus in on the essence of what we’re hungry for, then we can get creative about how to satisfy that need in ourselves. e.g, if it’s spending time with loved ones, maybe you can get a baby sitter, and take your partner out to dinner. You might not have to go all the way to Bali. Like a lot of things in life, I think FOMO has many lessons to offer, but shouldn’t drive us in life. See the fear of the pain of regret for what it is, but act from as clear an intention as possible – the intention to do what you truly want.